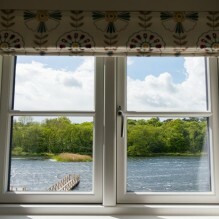 The Boathouse at Ormesby Broad is a truly magical place to come and stay in the Norfolk Broads. You’ll love the stunning location, views and beautifully refurbished unique rooms and you can enjoy a relaxing meal in the restaurant or pub whilst overlooking this quiet Broad. The Boathouse is an exceptional pub with rooms, as well as having two lodges which you can hire on a self catering basis. It’s also the most idyllic wedding venue that I’ve seen in Norfolk (and a third lodge is for the exclusive use by the bride and groom when you get married here)! The setting is beautiful, sitting right on the edge of peaceful Ormesby Little Broad with stunning views over the water which you’ll enjoy from the restaurant, the rooms and the gardens. It’s a dog friendly pub, however, the rooms are not dog friendly, so if you want a dog free holiday, this is where you should come to! It really is the perfect place for a mid-week break. I say this because most weekends are taken up with weddings, so if you want a quiet stay, then mid-week is definitely the best time to come. If, on the other hand, you wanted to get married here, then take a further look as it is a magnificent place to get married, right on the water’s edge. 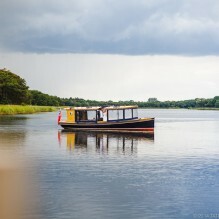 Ormesby, Rollesby and Filby Broads (known as The Trinity Broads) are land-locked which means there's no way connecting them to the other more well-known and busier Broads network of waterways such as Hickling and Wroxham. This makes The Boathouse a very special place to visit because no boats are allowed access on this particular Broad. You may find the odd sailing boat on Filby Broad, but on the Broad outside The Boathouse the only boats allowed are little canoes taken from The Waterside at Rollesby and Gentleman Jim (if you’re getting married here you can arrive at the venue by the Gentleman Jim boat!). No chugging commercial motorised Broads boats in sight! This really is the “alternative Broad”. If you’re looking to be near water and wanting to visit The Norfolk Broads, but not be in amongst the hustle and bustle of the crowds, then The Boathouse is worth a more detailed and further look - keep reading! The actual pub dates back to 1854 and was originally called Eels Foot until it was taken over in 2014 by Michael and Belinda Minors. Back in the 1800’s, it was listed as a “beer house and pleasure garden”. Michael and Belinda bought it in an incredibly run down state, and at that time, as just one small building. They have kept the history of the pub alive which is evident in the building, but at the same time have brought it up to a very high standard of modernisation. The attention to detail is second to none. I don’t think I’ve seen such unique rooms in any pub. a stand-alone wedding venue, all done up to exceptionally high standards. It’s the little details that make all the difference at The Boathouse. One wall in the pub is covered with old photos and postcards of what the pub, the Broad and the surrounding area looked like, all cleverly made into wallpaper. And lest you forget you’re on a Broad, you’ll soon be reminded by the clever usage of many oars or paddles dotted around the place and used in clever ways! All of this just makes for a really enjoyable and very different stay. You can read more about The Boathouse and your stay here. 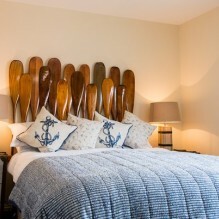 All of the rooms in The Boathouse are totally unique and very tastefully decorated – every bedroom is different and all the furnishing and fittings are unique to each room. There are cupboards everywhere, always a plus when staying somewhere, and everything has been thought about very carefully right down to the very smallest details; lights coming on automatically as you open the bathroom door, or the tray with all the tea and coffee making facilities is not just a tray, but has a special place specifically for the kettle, and a little strainer for putting your tea bag on when you’ve finished with it. 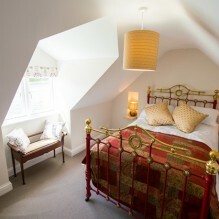 The colours are subtle and relaxing, and most of the rooms have stunning views over the Broad. Then there’s a little holder for the Wifi password without having to rummage through sheets of information to try and find it. Perfectionism I would call this! And there are oars everywhere to remind you that you’re staying in the Boathouse! As well as every bedroom being different, every bed (all are king or double) in each room is also different, so in one room you may have a cast iron bed, in another you may have paddles as the headboard. In another you may have a sailor’s telescope sitting ready at the window to catch sight of the wildlife on the Broad. The bathrooms are also beautifully laid out, with unique backdrops to the showers or baths, and everywhere is immaculately clean. I personally was very impressed. There are more details on each of the rooms here. There are two lodges which you can stay in that are a stone’s throw from the main building. Bittern Lodge and Heron’s Nest. Both have the advantage of their own decking with views of the Broad. Yet again, these lodges are furnished to very exacting standards. individually picked paintings and pictures hanging from the walls. 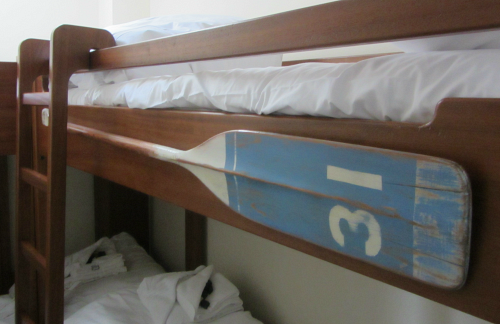 Even one of the bed ends in the bridal lodge has an oar cut into the wood. You can find out more about these wonderful lodges here. 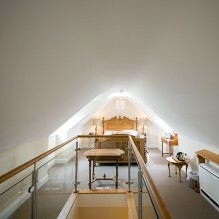 Heron’s Nest has an open plan extremely nice kitchen and sitting area, 3 bedrooms and a shower room and can sleep 8. 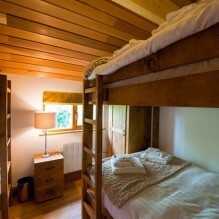 Two of the rooms have king size beds, one with an ensuite shower, and the third room is very unusual, something I’ve never seen before – it has a single sized bunk bed and an adult sized double bunk bed in beautiful oak – really nice and great for having a comfy night’s sleep! If children are having this room, they’ll love the big bed. Bittern Lodge also has an open plan kitchen and sitting area with three bedrooms which comprise two king size beds and the third bedroom has a single bed and a bunk bed. 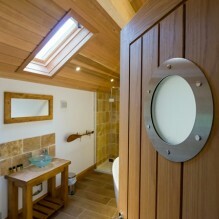 This also has a shower room and can sleep up to six. 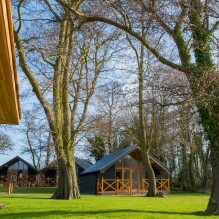 You can find out more about the lodges here. 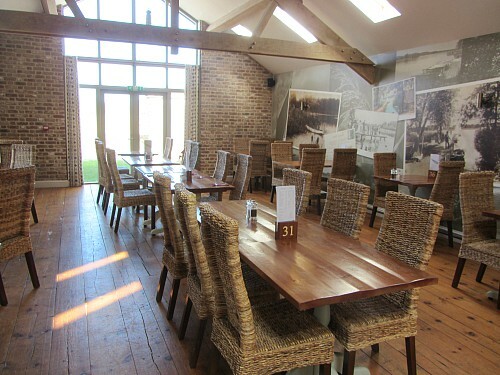 You can dine in the restaurant or the pub area, both are light and airy. 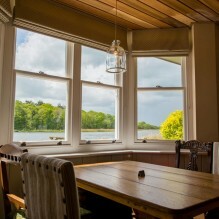 The bar area has the wonderful bay windows with views over the Broad. And as it’s a fairly large open space, you don’t feel cramped or on top of the people on the next door table. With wood floors, old photos dotted about on the walls and exposed brickwork on most of the walls, this has a very relaxing feeling. 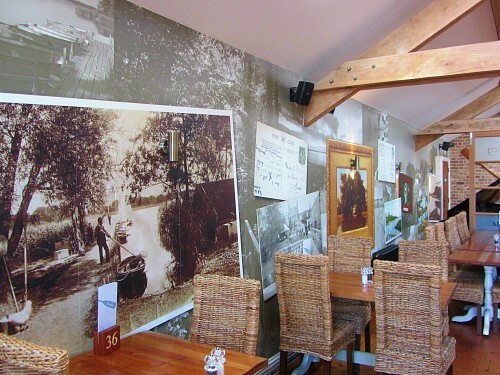 And the restaurant has the wall with the murals of the old postcards and photos. 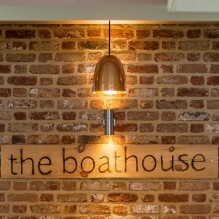 Yet again, as with everything at The Boathouse, attention to detail is very exacting, without it feeling over the top. They are however closed on Monday, but open from Tuesday’s to Sundays. Find out more about the pub and the restaurant here. Getting married at The Boathouse! If you want a wedding with a difference, this is the place to look at. You get married in the gazebo overlooking the water, your guests are seated on the decking (weather permitting!!) 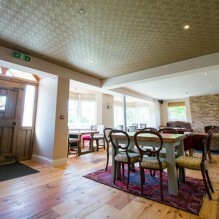 overlooking the Broad and you can dine and dance the evening away with your own private area away from the pub. And to top all that, as bride and groom, you can stay the night in your own lodge, Tern Lodge, while your guests can take over the other available rooms. It is magical, and a memory that would stay with you for ever. Check out more on how to make your special day one to remember! 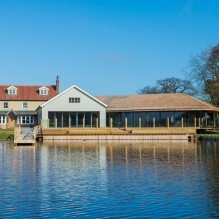 The Boathouse really is an extremely unique place to stay in The Broads, so why not treat yourself to a wonderful stay in this relaxing and very special pub.